After many beta versions and unstable early releases, the next major release of our civilian firmware, 8.3, is finally available. 8.3.2 addresses a number of common bugs encountered by testers of the 8.3.0 and 8.3.1 versions which were newly introduced in those patches. As of 8.3.0, the Tai Yong Labs DAX/T (part number SXD-02-0800-T) is officially deprecated following the closure of Tai Yong Medical. Existing DAX/T users are encouraged to look at the controller comparison page and consider a replacement. DAX/T controllers will continue to function and be updatable as long as 8.x DAX/2 controllers are supported (i.e., until the release of version 9.0), but controllers retrieved using (Redeliver) monads will be stuck on 8.2.1, and not updated to the present or future versions. If you are running 8.3.0 or later, select update. Select the System_8.3.2 package and upgrade it. Accept the notecard _System_8.3.2_info when it is offered. If you are running an Aegis that was previously running 8.2.0, there are additional instructions inside that are very important. Installation will take up to 2 minutes. You will receive a message saying If this is the first reset after a system update, you may now boot the OS. when the process is finished. What's new in System 8.3.0? Ongoing work to translate more dialog-based menus into the new ex4-compliant format. ORIX controller identification protocol. For now, the type field is limited to 'NS' for standard controllers or 'SXD' for SXD and DAX/2 controllers, but this will change eventually to support reporting of e.g. cyborgs. properly fixed sendchannel_sec restraints that were blocking /channel chat even when the output pipe was disabled. 'Stargate telemetry received' message only when unit is focus of TP. Make 500 edit the menu directly instead of relying on the main display function. What's new in System 8.3.1? What's new in System 8.3.2? Our home sector, Latexopolis, has been officially redesignated Eisa by the Galactic Standards Authority. Please ensure all mail is correctly addressed. System 8.2.1 is here. This patch is mostly bugfixes, and addresses many common complaints and minor irritations reported by users over the past few months, ranging from the vertical offset of the shutdown animation to sporadic difficulty with emitting normal speech. Installation. Go to the following menu: manage > software > update. Select the System_8.2.1 and upgrade it. Accept the notecard _System_8.2.1_info when it is offered. If you are running an Aegis, there are additional instructions inside that are very important. Restoring your user list. If you are running an NS-476 or NS-115, or an NS-112 released after Aug 24 (i.e. one that came with 8.2.0 installed), then you must perform an additional step to retrieve your user list. If you are running an Aegis, an updated version of the hinge controller script is available. This will fix issues with the controller flipping open when unauthorized users try to open it. Installation instructions (and the script itself) are included in the patch readme. Finalizing. Reboot once to apply the applicable changes from steps 6–7. Disabling the output redirect stage on the vox pipeline is now default; this should hopefully prevent people encountering the majority of situations in which they are unable to speak without explanation. @chorus and @drainprotect fixed again. [diagnostics] now disabled on the charger—because literally no one uses it right; you get a message telling you how to turn DDT on instead. Battery loading on login finally fixed—although replacement batteries are required. These will be made available soon. Only apply _sec to channel redirects when outpipe is enabled—this fixes trouble with chatting on other numbered channels. Finally fixed clicky issues for good? User list storage is automatically migrated from face 0 of the root prim into face 0 of link 2. Aegis, Scout, and Aides purchased since the release of the Aegis all default to different places, the details of which are above. "@keychain migrate <face>" will grab media info for people who purchased controllers since the release of the Aegis. User list media is now stored on link 2, face 0. Prevented adding anything that isn't 36 characters long as a new user to the keychain; this should effectively quash most risks from invalid input. Persona #RLV folder is now automatically removed in case of on_rez() or power down. fm_standard and fl_polyglot now reset when receiving message 801.
vox chain removal fixed; filters weren't being removed from sublists. Aegis won't flip open when physical access is denied, but fixing this requires either manual script replacement or redelivery of the controller. The NS-115 Scout is a compact form-factor controller originally intended for support and light assault roles. Like its larger predecessor, the NS-112 Aide, the Scout has been demilitarized, and is now available for purchase by the general public. Scout units are ideal for logistics and shipping roles, and specialize in strategic planning at the cost of other functions such as interpersonal skills or general-purpose reasoning capacity. 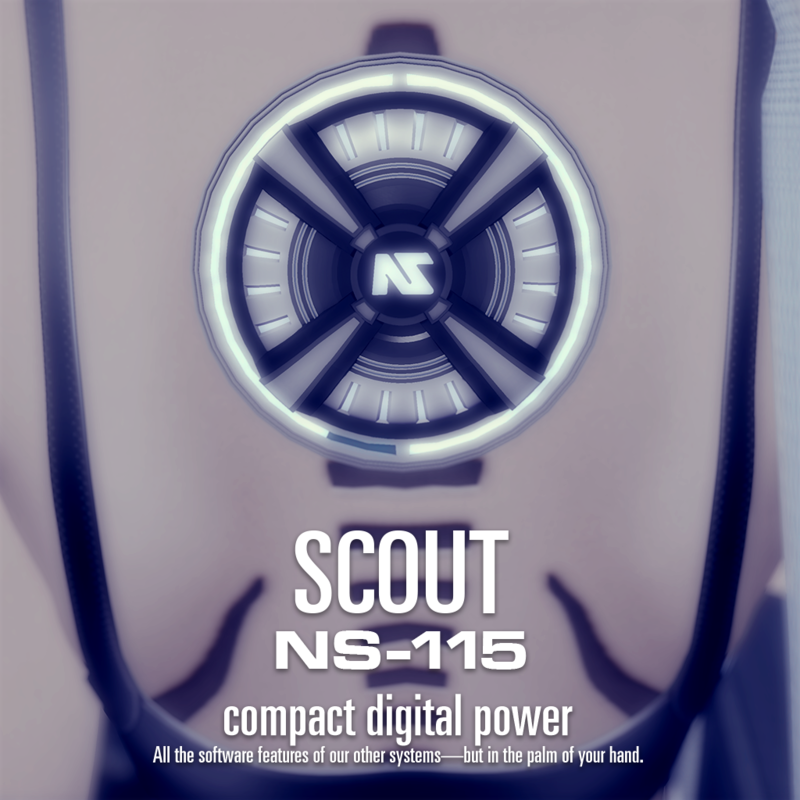 The Scout controller is available for purchase at all major NS locations. An update to the Nanite Systems Collectors' Display Case is now available, featuring a cleaner mesh design (just 3 LI), baked AO, easily customized screen images, arcade-booth-like side art, and the Solo Jazz pattern. Existing owners of the display case can trade in their old versions for a new one by contacting a senior service representative. The first version of the Aegis is now available for direct purchase by our civilian and military partners. View the full announcement here. If your unit has a 7.x controller still (or earlier), send rhet0rica an IM or e-mail. If your unit is running an 8.x controller, come visit our main campus to download the firmware update without requiring a re-install. See the instructions below. If you are running an Aide on System 8.0.4a (i.e. one that has never been updated), you will first need to patch your software manager to accept system updates from the correct source. Before instruction 3 below, install Hotfix_8.0.5 from xpatch:0 in the manage -> software menu. 2. Take the unit to a region where Xanadu server access is available. At present, this is only the Nanite Systems Main Campus. If your unit is running 8.0.5 or later, have the unit type @keychain save to ensure the user table is kept after updating. 3. Start the update from manage -> software -> install -> xcentral:0 -> System_8.1.3 -> install. Updates may take up to 5 minutes. If the unit is running 8.1.0 or later, the installation will appear under the update menu instead of the install menu. This will be the case for all future system updates. If the unit reports an error message about button lengths in dialogs, remove the instructor package from the unit prior to updating. It can be reinstalled from xpatch:1 afterwards. 4. Reboot the unit to reinitialize the battery interface. 5. Have the unit type @setup console to activate the new HUD, and reboot again. 6. If the unit was previously running a beta of System 8.0.5, have the unit type @keychain save again. This should remove any spurious media object controls that might interfere with accessing the controller's TTY menu. Notice: this is a clean install, and so any settings stored in RAM—user list, sound scheme, boot style, volume settings, power profiles, color options—will need to be re-installed afterwards. Files on disk (personas, actions, installed software packages) will not be affected. RAM data by installed software packages (e.g. instructor interval) will not be affected by this update. If you see the error message: llDialog: button labels must be 24 or fewer characters long while attempting to connect to xcentral:0, remove the instructor package from manage ->software -> remove before attempting the update. This is a known issue with multiple package updates being required. A new version can be installed from xcentral:0 after updating is complete. If you see the message: Updating package list... when attempting to access the 'install' or 'update' menu, reboot the unit (e.g. using the console command @shutdown -r now) and then choose manage -> software > disconnect before proceeding. This issue was fixed in 8.1.0. What's new in System 8.1.3? What's new in System 8.1.2? - @bolts: requires manager access, supports 3 states (lock, normal, release). Release leaves the controller fully detachable unless locked (or locking is enabled and the unit is powered down); normal is the current convention of 'non-detachable when on'. The controller defaults to 'normal', so no one should notice any differences. - @profile should work again (ely5ia)—and for real! What's new in System 8.1.1? - Passive devices may make certain queries even if they are owned by another avatar—previously this was forbidden; this should be useful for interacting with base stations etc.—these have no chance of harming the unit. - '@keychain load' now sends message 20, so all components will be aware of the correct owner. - Interference can no longer be applied while the unit is powered down. - HUD now displays personality correctly if one is active when it is attached. - Missing speech sound (EOF) during boot no longer causes debug messages. - Made the _arabesque 'remark' (ownersay) feature into a real command. - 'remove' button for active devices (except battery). - Sink replies from old icons generate 'access denied' spam—handled this by ignoring any numbers sent to the remote radio interface. - Remote access and device TTY accesses (including the HUD) should now refuse to abet illegal self-access. - Fixed @safeword not restoring self-access. - Exhibition didn't respect self-access when using remote dialing (e.g. HUD or remote console menu access)—HUD should respect this now too. - The personas menu can no longer be opened by the unit when self-access is disabled. - Fixed a bug preventing RLV folder loading and a separate bug preventing the RLV path from being updated on the cortex. - Arabesque now has $name, $serial, and $serial_display (with hyphens) and should auto-populate these constants properly and reliably. - The "device connected" voice message should now only play once when starting up. - "@coil status" math fixed. - Updates to included Arabesque actions. For earlier patch notes, see our 8.1.0 release page. If your unit is running an 8.0.x controller, come visit our main campus to download the firmware update without requiring a re-install. If your unit is running 8.1.0 or a beta of 8.0.5 (or 8.0.4.x), have the unit type @keychain save to ensure the user table is kept after updating. 3. Start the update from manage -> software -> install -> xcentral:0 -> System_8.1.1 -> install. Updates may take up to 5 minutes. If the unit is running 8.1.0, the installation will appear under the update menu instead of the install menu. This will be the case for all future system updates. If the unit reports an error message about button lengths in dialogs, remove the instructor package from the unit prior to updating. It can be reinstalled from xcentral:0 afterwards. If you are running an Aide on System 8.0.4 (i.e. one that has never been updated), you will first need to patch your software manager to accept system updates from the correct source. Before instruction 3 below, install Hotfix_8.0.5 from xpatch:0 in the manage -> software menu. If your unit is running a beta of 8.0.5 (or 8.0.4.x), have the unit type @keychain save to ensure the user table is kept after updating. 3. Start the update from manage -> software -> install -> xcentral:0 -> System_8.1.0 -> install. Updates may take up to 5 minutes. If the unit is running a beta version, the installation will appear under the update menu instead of the install menu. This will be the case for all future system updates. What's new in System 8.1.0? - Added upper limit on interference to prevent abuse. - New @zap command; more flexible and consistent than old method. - @color will no longer set the lights to black when unknown parameters are provided. - Devices can now inquire as to the current system color with the 'color-q' light bus message. - The identity -> color menu item will now save the color instead of setting it temporarily. - Ownership now reverts whenever the unit has no owner at all, not only when user list is cleared. - Fixed erroneous information in some command help messages. - Fixed parameter handling on @coil. - Prevented @shutdown from starting a 30 second timer in several inappropriate situations. - Removed !relay (now implicitly part of remote access). - Major refactoring and overhaul of _submission; added command-line user management and runaway command (@keychain). - Users list can be saved and restored. - Xanadu now shows firmware under 'update' menu correctly. - Removed ".00000" from power profile loaded message. - Fixed problem with loading empty keychain. - Fixed problem with stretched screen on DAX units. - Made system updates appear under 'update', not 'install'. - The cortex will now always allow @safeword. - Added @sxdwm connect/disconnect, to permit remote TTY menu access. - Improved command response formatting in _foundation to emit OwnerSay() messages less when unnecessary; other changes will probably be necessary. - Report following to devices: follow + follow-q to reduce conflicts. - Local console HUD support implemented (in particular, @devices, but also device remove detection.) The local HUD will automatically attach and update itself once "@setup console" is performed. Old HUDs can be removed safely from the #RLV folder. - Fixed owner query on scan; all units were reporting as self-owned. - Various obscure bugs fixed. - Added @coil ddt to enable/disable diagnostics when away from a charging station. - Removed Away animation (drooping head) when powered down; was only visible on SXDs and certain sitting animations. - Switched from llGroundRepel() to @avatarheight:10=force when powered down; should stop 'freefall' bugs. - Switched to using part descriptor tags to identify memory card—renamed from 'program' to the unit's proper name. - Grievously bad typecasting bugs with power profile management; added '@profile save' and '@profile delete'. - Tweaks to spark system. - Persona display added to HUD. - Patch notecard stuff; deletes after shown once. - Fixes for HUD auto-attach/give. - Fixed "Remove access" typo in _submission. - Fixed leaky media controls affecting some beta users. - drainprotect now properly covers ACS charging devices. - Carrier management (support for multiple handles). - Rebalanced teleport EMP (now causes brief interference in nearby units and gives less charge) with new burst pattern for effect. - Moved PIN management into separate module (_obedience Access Manager) to give user management functions more headroom. For earlier patch notes, see our 8.0.4 release page. 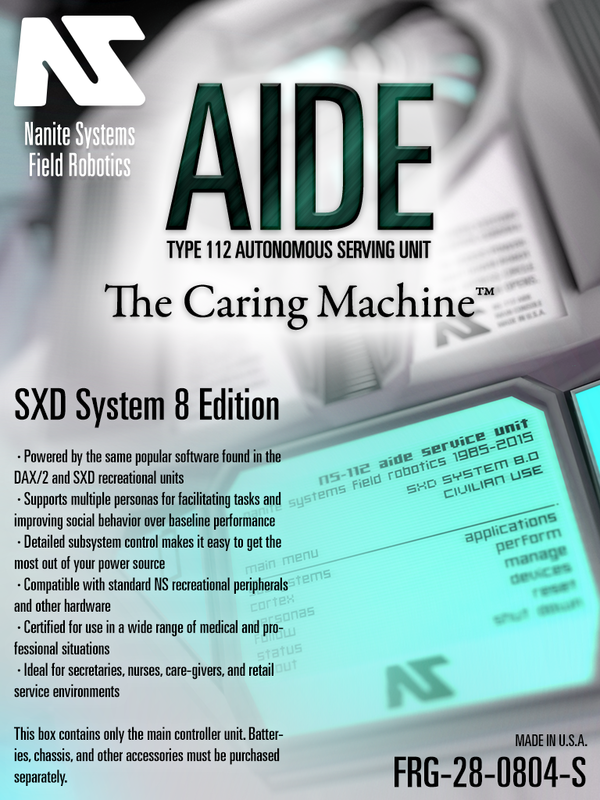 Nanite Systems is pleased to announce that the NS-112 Aide general service robot has been cleared by the Federal Drug Administration for use in medical settings as a Class I medical device under section 21CFR890.5050 when running the standard Recreational Cybernetics SXD System 8.0.4 software package. The NS-112 Aide is one of the company's oldest and most successful designs for an articulated synthetic. It was originally designed for the United States Army in the early 1980s for use as a field medic and adjutant. Since its release in 1985, the Aide has seen an immense amount of success in the civilian sector in menial labor, service desk, patient care, and office administration roles. With System 8, the NS-112 receives a much-needed refresh for the 21st Century, providing it with access to the same diverse range of software available in our award winning SXD and DAX/2 platforms, without compromising its famous reliability as a service robot. Contact your local vendor or visit our online store for more information about the Aide and other Nanite Systems products. If your unit is running an 8.0 controller, come visit our main campus to download the firmware update without requiring a re-install. This also applies to those running the 8.0.3 release. Note: if you purchased a controller from the new display stand and never updated it (i.e. not just a box on the table), there were permissions errors in the 8.0.2 copy being distributed. You were sent an 8.0.3 controller and should switch to it to begin updating. 3. Start the update from manage -> software -> install -> xcentral:0 -> System_8.0.4 -> install. Updates may take up to 5 minutes. 4. Reboot the unit if necessary to reinitialize the battery interface. What's new in System 8.0.4? - Fixed ACS interference vanishing on reboot, lack of guaranteed time-out. - RLV commands now combined on one line per subsystem; far quicker! - Removed 'commands' from the main screen because it's too obscure; still present in 'manage'. Decomposed the 'power' menu to keep the menu full. - Decomposed the radio metasystem into 'SMS in' and 'SMS out'. - No more getting stuck in manage menus after submission reset! For earlier patch notes, see our 8.0.3 release page. For many users, four hours is a sweet spot: it's enough time to go out and see a movie and have a comfortable dinner date before returning your synthetic loved one to the charging stand. 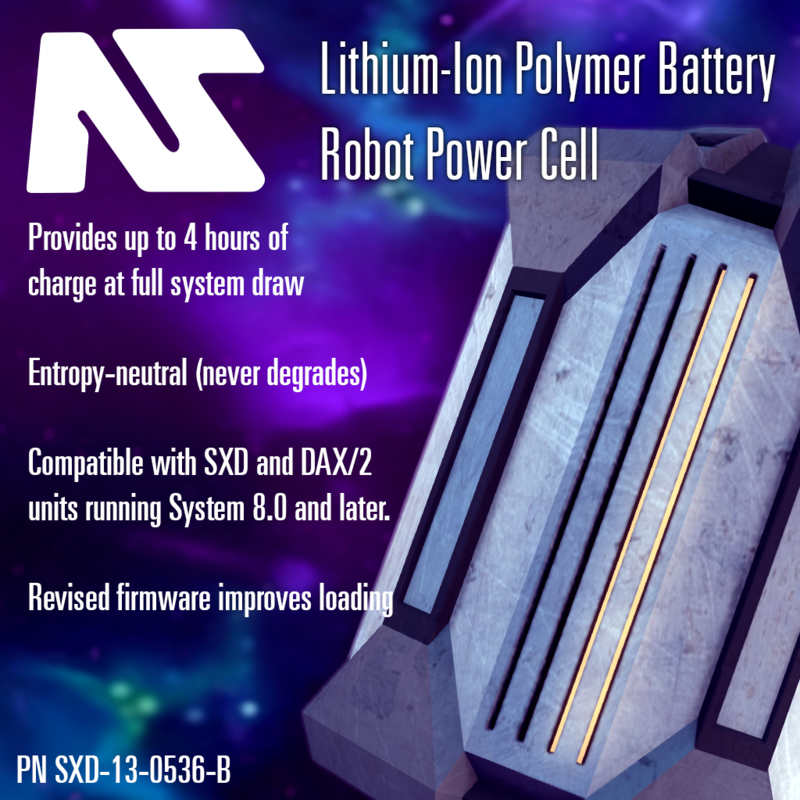 That's why we're introducing our new Li-Po battery cell, serial number 13-0536-B, which gives you just that. This product is unaffected by today's recall announcement, and is introduced at a retail price of L$175. A flaw was found in the common battery firmware of these power sources that has been deemed responsible for poor load/unload performance and sporadic loading failures. Please consult your NS dealer to trade in your current power source for a replacement part. Come down to our store in Latexopolis to pick them up! If your unit has a 7.2 controller still (or earlier), send rhet0rica an IM or e-mail. If your unit is running an 8.0 controller, come visit our main campus to download the firmware update without requiring a re-install. This also applies to those running the 8.0.2 release. Note: if you purchased a controller from the new display stand (i.e. not just a box on the table) within the last two weeks, there were permissions errors in the 8.0.2 copy being distributed. You have already been given a new 8.0.3 controller; look in your inventory! 3. Start the update from manage -> software -> install -> xcentral:0 -> System_8.0.3 -> install. Updates may take up to 5 minutes. What's new in System 8.0.3? - Fix support for OEM prefixes. - Fix power profile announcements. - 'auth' light bus command (e.g. from horns and handles) was causing a linked message loop in the Security Manager, slowing down sims immensely. Fixed. - Deferred exhibition messages during load until loading is complete, preventing 'button not found' errors during update or other full system reset. - Subsystem states are properly re-applied following a reboot. - Video is now a critical system and not suppressed at low power. - System automatically shuts down at 5% power and imposes heavy restrictions if booted with less than 5% power. - 'status' button on main menu now triggers @power status also. - PIN entry menu was off by 1 on touch screen. For earlier patch notes, see our 8.0.2 release page. If your unit is running an 8.0 controller, come visit our main campus to download the firmware update without requiring a re-install. This also applies to those running the 8.0.1 early release from last night. 3. Start the update from manage -> software -> install -> xcentral:0 -> System_8.0.2 -> install. Updates may take up to 5 minutes. What's new in System 8.0.2? - No longer lists 'default' in the personas list. - @attachover instead of @attach for RLV in personas. What's new in System 8.0.1? - Removed 'recharge complete' message. - Started work on support for ACS interference. - Reduced lag when navigating the menus. - Improved device connect negotiation process. - Fixed bugs with color going black after a_rainbow execution. - Fixed issues with long unicode names in security manager. - Fixed inability to leave power profiles menu. - Whole controller is now more touch-responsive, more like in 7.2. This is still fairly beta, but deals with the majority of bugs that users frequently reported. There are still lots of things to do, though, so stay tuned. For the time being, this package may be reinstalled as many times as you want in case you damage something. - Redesigned controller to use the SXD 8.0 touch screen, to have a more compact profile, to include a memory card slot, and to require a battery. - Added Xanadu package management system. Now you can update your unit and install extra software without as much headache as before! - Combined interface controls for volume. - Combined interface controls for motor speed. - Added @ commands. Most new menu functions work through these. - Added power profiles—no more messy/spammy performer scripts for changing activity levels! - Added DrainProtect to prevent negative charging by environmental sources. - Moved cortex subsystem to separate menu, to be populated with other stuff by upcoming features etc. - Added/fixed 'programs' menu. Check out the 'Hello World' sample script in the memory card prim (the triangle on the back) for an example in how to create accessible programs for your unit. - Added documentation file for 7.2 light bus and linked messages protocols explaining how to use the system. - Split radio into "in" and "out" subsystems. Developing an excellent product takes effort—which is why the System 8 release date is now expected to be on March 7, 2015, rather than February 28 as previously predicted. But don't worry: it'll be worth the wait. In the meantime, we have a somewhat more shocking news item: the Pulse Charger is now available, which provides a flat 10% charge* to all DAX/2s in the region. It's noisy, it's ugly, and it packs quite a punch. Get yours now at our main store for just L$100. Nanite Systems is proud to announce that it has begun selling metalloplastic epidermal coatings in a variety of colorings, starting with six schemes (plus one bonus scheme) inspired by totalitarianism, capitalism, and mysticism. Each is available for L$300, with a combination pack containing all seven for just L$800. Stop by our store today to discover more. First, the NS charging platform is finally available for SXD and DAX/2 systems, featuring a real touch screen and integrated diagnostics. Its introductory price is L$ 600. Second, System 7.2 updates are now available for the DAX/2 controller. This is still beta-quality software, but addresses many of the issues with 7.1, including support for stored programs, follow termination, and separation of radio reception and transmission into two separate power subsystems. Drop by our facility or send an IM to rhet0rica if you are interested in this update.